You all might know I'm working on a team site which will be designed to attract, funnel and then send to your Lotto Magic Online site - traffic based on the search term "What is a Lotto Pool". 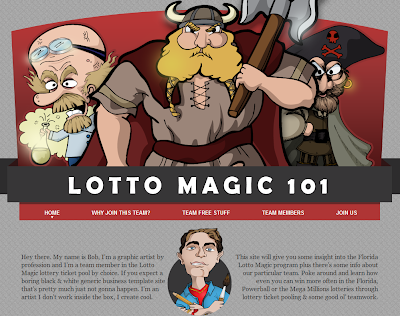 The new team site is located at: www.LottoMagic101.Net. My focus is on this particular set of key words because there are already thousands of people out there joining office pools for their favorite lottery. A new video based on the Lotto Magic Online video (or similar) to be posted in the next few days. Not the one to be used on Team Free Lotto Magic site but it's still very informative with some "snappy" music. Visit here again soon for that one, you're going to like it promise. Hey - If you're here and researching our team best join soon otherwise if you wait then the people that join today... will be your upline tomorrow, guaranteed! Also if you're already a member in Florida Lotto Magic you can always have your business "or" a relative join our team. Everything we do and give you as a member on our team to help build your Lotto Magic team is free so what are you waiting for? Not sure we have the power to make you a success in Lotto Magic? Go to Google, choose your preferred Lotto Magic related search terms and see where they eventually take you. I joined for the same reason... this massive network of online ads, video's, social media, newspaper ads and more all lead back to our team "The Lotto Magic Team where new members must join current members. Don't miss the lotto pool boat! OK, the soft sell is over. I must get back to Dreamweaver and start coding before it get's too late! Lotto Magic Review: For those that asked for a Lotto Magic review - I've done reviews before but it's hard to remain unbiased just so you know. I've seen the reviews sites out there and even a couple of the available Lotto Magic reviews type sites and blogs but again most are more like commercials with subliminal messages then anything else and I believe most "reviews" are exactly that. I "might" give it a shot, I'm just not sure yet but I thank you for having the faith in me to recommend I do one. Yes, I'm actually commenting on my own post, how novel. I must be getting old because I just realized after posting above that the new video for Team Free Lotto Magic pops into the YouTube widget there on the right automatically. So, you can view the new video there even though I'll still post it here since if I don't notice the YouTube Blogger Widget then you (and visitors) might not either!